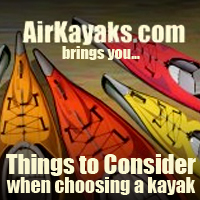 The following article was provided by airkayaks.com and used with permission. 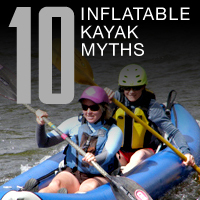 When you're ready to purchase an inflatable kayak, be sure to check them out before you buy. Gone are the days when inflatable kayaks were simply pool toys. With recent dramatic increases in technology, today�s inflatables have evolved into everything from family recreational fun to high-tech specialized watercraft � some even rival the performance of hard shell kayaks. So why choose an inflatable? 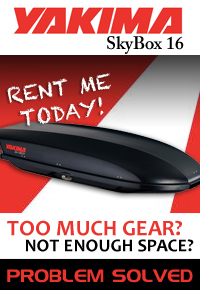 The biggest reasons are portability and storage. The ability to travel with an inflatable � either tossed into the back of your car or RV, taking mass transit, backpacking into remote areas or flying around the world � is appealing to many. Inflatables also solve storage problems � the bags and backpacks can easily fit in a closet or trunk of a car, and there is no need for cumbersome and expensive roof racks. Many of the inflatables are lightweight � making it easier to manage � and can hold one, two, sometimes three paddlers, making it great for family fun. Most are rugged and incredibly stable, appealing to those nervous about the water and leary of �tippy� hardshells. Many have hulls which can take scrapes, bumps and submerged sticks and logs without a blip. And in the remote chance that you do puncture your kayak, most can be easily repaired with the included maintenance kits. Simply cut a patch, put on glue, apply pressure and let sit overnight. With the number of new inflatables hitting the market, there are now many styles to choose from for a wide range of water activities � from oceans to ponds, slow moving rivers to white water or wave running. Self-bailing kayaks: These are typically used in whitewater situations. Self-bailing kayaks have numerous ports � or holes � located in the bottom of the kayak. When in a fast-moving whitewater situation, this allows water to enter the kayak and pass back out, ensuring the boat doesn�t fill up. Expect a wet ride. Conversely, if you are on calm water, water will come in through the floor ports unless the kayak has plugs that can be opened or closed. Many self-bailers don�t have tracking fins, meaning they may not perform as well in flat water. Sit-on top kayak: An open design kayak. This is great for people who have difficulty getting in and out of an enclosed shell, those who tend to feel claustrophobic, and for those in warmer climates. Conversely, water will splash in more easily unless you have some type of spray deck. Sit inside kayak: More of the traditional kayak design, with an enclosed cockpit. This is great for keeping water out of the kayak during inclement or colder weather and has the ability to attach a spray skirt, further expelling wind and water. Canoe-style � this typically features an open design with higher walls and higher seats. Canoe-style paddlers often use canoe paddles (single-sided blades) rather than the double-sided kayak paddles. Open style kayak design: This is a kayak version of the canoe style, featuring higher side walls than a sit-on-top but lower seats than canoe-style. Paddlers use the traditional double-sided kayak paddle. This hybrid is good for people who want easy entry, a more open design. The higher walls prevent more water from entering the kayak, but still is less enclosed. Some have optional spray decks to keep more water out, making them more enclosed. Standup Paddle Board: This is the newest entry to the inflatables market and increasingly popular. Termed inflatable SUPS, or ISUPS, the boards can be pumped up to very high pressures of 10 to 25 PSI, making them quite rigid. Paddlers stand up while paddling, and these can be used for surfing, recreational paddling, downriver whitewater, racing and fishing. Some of these include d-rings, allowing on to attach a seat and use it as a �sit-on-top� or paddle kneeling. Tracking fin: A fin located on the underside of the kayak, helping the kayak to �track� better (paddle straighter) and prevent some side-drift. Fish-tailing: The shorter and lighterweight the kayak, the more it will have a tendency to �wag� � meaning, the nose will turn back and forth in the direction of the last paddle. This can be rectified by shallower, easier strokes, and sometimes by putting weight on the front hull. Questions to Ask Yourself When Choosing Your Inflatable. 1) Do you want the ability to paddle with another person (tandem), do you wish to paddle solo or do you want both options. Some people work well paddling with another, some don�t. If you�re the type of person who wants to amble along at their own speed, then a single kayak might be right for you. If you want both options, look for a kayak with various seating positions � typically with front and rear seat clips, as well as a center option. This allows you to move one seat to the center to paddle solo, while removing the extra seat. Kayaks with fixed seating areas can also work if you sit in the rear seating well, and put weight in the front. Tandems with various seating positions can also be great for bringing your canine companion or the kids. 2) What type of water conditions will you typically encounter. Coastal, ocean, calm lakes, swells, whitewater, surf, moving rivers, etc.? What works for whitewater will not work best for calm lakes. Decide if you want to be enclosed or more open. Will rain and wind, or heat be an issue? Do you need easy entry? 3) What is your size and height. How much weight will you need to carry? 4) Will you be carrying a lot of paddling gear? Look for something with various storage space or with attachment options to allow you to clip on storage bags to the top front and rear hull. Additionally, a tandem kayak that can be paddled solo will provide more space for gear. 5) Do you plan on long excursions, short paddles or all-day use. Will you be fishing or scuba diving? This ties in with points 3 and 4. How much room do you need for yourself and supplies. Do you need camping gear for a week kayaking trip, or do you just want to hit the water for a few hours of relaxation. Do you need to easily get in and out of the kayak from the water. 6) What type weather or water temperatures will you be paddling in. Do you want the ability to use a spray skirt or do you prefer a more open design? If you plan on paddling during stormy weather, winds or winter months, you may want a kayak with a spray skirt option. The spray skirt attaches to the kayak cockpit, and then to your chest, allowing you to keep out wind, spray and some of the chill. If you�ll be out in lots of sun, you also might want something more enclosed, or on the opposite end, something that allows you to easily slide into the water to cool off. 7) Do you need a self-bailing option? Self-bailing kayaks have holes in the bottom and are used predominantly for white water situations. As you travel through rapids, the water that spills inside will pass out through the holes. Conversely, if you are in calm channels, water will come back in. Some self-bailers feature plugs, allowing you to open or close the holes as needed. If you plan on mostly calm water, lake, slow rivers or ocean kayaking, then you probably do not need a self-bailing option. Some kayaks come with drain plugs, not to be confused with self-bailing. A drain plug allows you to drain out any water that might have dripped into the kayak. 8) What weight, length of kayak do you feel comfortable carrying around? Test out various scenarios by carrying a pack or bag with different weights, so you can compare to the weight of the kayak in the carrying case. A very long kayak might be a bit difficult to carry solo in high winds, but also note there are travel options � such as a breakdown dolly � that can make this task quite manageable. 9) Do you prefer more of a canoe-type paddle (sitting up higher from the water) or an enclosed type kayak that is lower in the water? This is a personal preference and also depends upon the type of paddling � and paddling conditions -you will encounter. 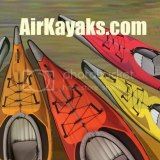 10) Do you want a �pump-up-and-go� type kayak, or are you more detail-oriented and willing to spend more time setting a kayak up? 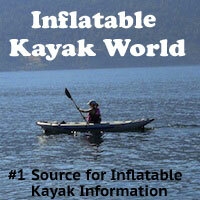 Most inflatables can be easily set up in 5 to 10 minutes � simply pump up the air chambers and you�re ready to paddle. This time an also be decreased with the use of a 12-volt pump to get the kayak partially inflated. Other � more performance-oriented � kayaks may take longer and have more parts/chambers. Are you more interested in getting onto the water, or are you willing to spend more time to get things right? At this point we wish to make one point about inflatables � if you will be out in cold water or air, pump the kayak up slightly more as the cold will cause the air to contract. Do the opposite if out in hot weather. And NEVER leave your kayak fully inflated in the hot sun � release some of the pressure. Once you consider the points above, you�ll have a much better idea of which type of kayak to look at. Still have questions? 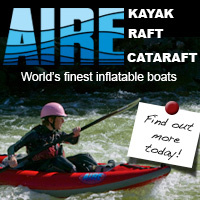 Feel free to check out inflatable kayaks on our website at www.AirKayaks.com, email us at [email protected] or call us at 707-998-0135.